Few things can stir up a controversy faster than that word. As a kid I remember fruitcake appearing right around Thanksgiving. I thought it was disgusting. The colorful cherries, the mere weight of that small cake, and the lack of, well, cake. Over the years I have had many fruitcake experiences, and they just keep getting better. When I first started my "little part-time" job 14 Christmases ago, we sold Assumption Abbey Fruitcake. I knew it had to be good, it's made by monks, and the webpage shows them injecting alcohol into the cakes. (Could it be Christian Brother's Brandy? I mean, let's keep this in the family right?) The first time I tasted it, I was so pleasantly surprised. It was dark, and nutty, and mildly fruity. The problem is, if you are like me and live among non fruitcake eaters, it can take a year to get through a 2 pound cake. Last January, I was in Florida visiting the parents, and my dad opens a tin from the fridge and unwraps a little chunk of fruitcake. Hey, what is that amazing aroma? 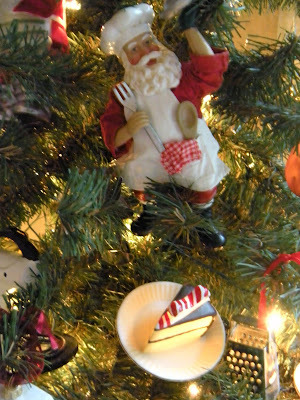 It just so happens that my sister in Iowa sends him a fruitcake every fall. It's actually 3 small loaves and he soaks one in whiskey, one in rum and one in amaretto. Then, he wraps them in old white t-shirt scraps that are soaked in the liquor, (he's 81, give him a little slack on this one, why buy cheesecloth when you have a drawer full of perfectly good, worn, white t-shirts? I personally suggest avoiding the armpits of the shirt). He gives the chunks a little nip now and then, and shaves a thin slice or 2, or 3 for breakfast every day. It is delicious. He would have made a great frontiersman (or pirate) with this innate ability to preserve food with alcohol, plus he's a great shot! But still, my personal fruitcake dilemma lives on. I have shopped the nicer grocers, but honestly, the fruitcakes are huge. I want a taste or two, not a two month supply. Then my friend Melinda was talking about her friends bugging her to make her fruitcake cookies. Whaaaat? Two things I love wrapped up together! So here we go. Here is the recipe as she gave it to me. Mix all ingredients. Drop by teaspoonful on greased cookie sheet. Bake at 350° for 10 minutes. So before I even go on how I made them, let me say this. For a foodie like me, nothing means more than a handwritten recipe. I love this. There is something about that little card that says "Enjoy, Melinda" that I will always cherish. It is a symbol of a friendship, the sharing of a recipe, the note of good tidings. It will find a home in my Christmas file and for years to come I will remember my friend at Williams Sonoma. Okay, I digress. Back to the cookies. My apologies to Melinda, I never follow a recipe. So, I used Bourbon not Whiskey. I could not bring myself to buy the candied cherries. The ingredient list was long and full of syllables, and they are very colorful. So I substituted ½ lb. of dried cherries and a bag of semi sweet chocolate chips. I thought chocolate would convince the non fruitcake eaters to taste them. I used Monukka raisins, they were dark and smaller than many of the other varieties, and soaked them in the Bourbon for about an hour. I also added ½ teaspoon of salt, I just thought there was a lot of sweet and it was going to need balance, especially since I used unsalted butter. I searched the web, avoiding the crazy million recipe sites and really couldn't find a recipe like this one. They are dark and not really cookie-like. My 17 yr old who insisted on the chocolate but hates raisins and fruitcake ate 2 right out of the oven. They are delicious. I am going to chill the dough before I bake the last of them, in hopes they will hold more of a shape. 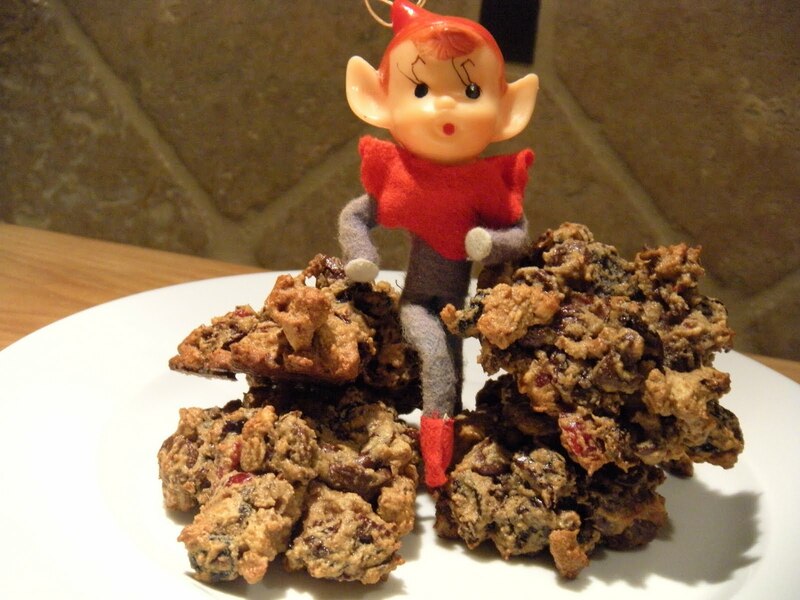 Then I will freeze the baked cookies, and plan on sending some to dear old Dad. These are a keeper. So, what are ya waiting for? Put on the Christmas music and get in there and bake! I admit my weaknesses. Goat cheese, Pinot Noir, 71% Dark Chocolate, (preferably all on the same night), and Christmas decorations. I have 3 trees in full regalia. 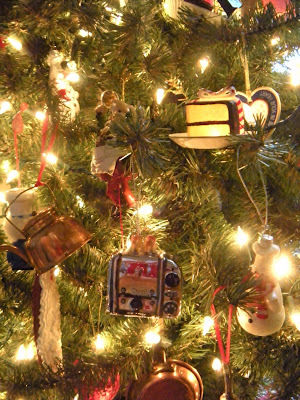 The family tree choc full of all those ornaments I pick up on trips, given to us at parties and those made in grade school. The second tree is in the dining room and is white and covered in snowmen. Note: Never tell people if you intend to collect something. I have more damn snowmen than I know what to do with! 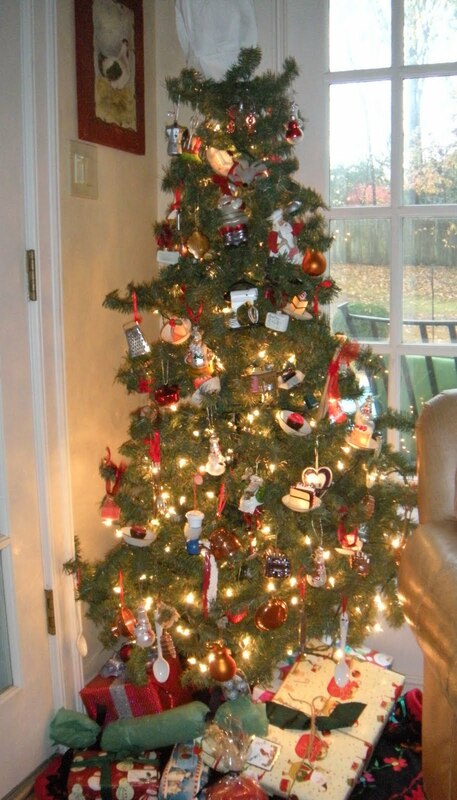 And the last tree is my favorite. It's only about 5', fills a corner of my kitchen and is covered in kitchen stuff. Cooking chefs and santas, copper pots and pans, whisks, silverware, petite fours and glass cheese. I love it! 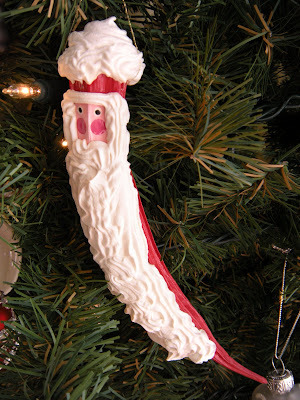 One friend brought me Christmas okra, a huge okra, like 6" and it's painted like Santa. How funny is that?! 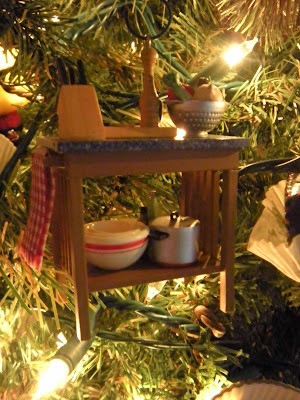 I also have a huge assortment of Williams Sonoma ornaments from years past. No big surprise there. 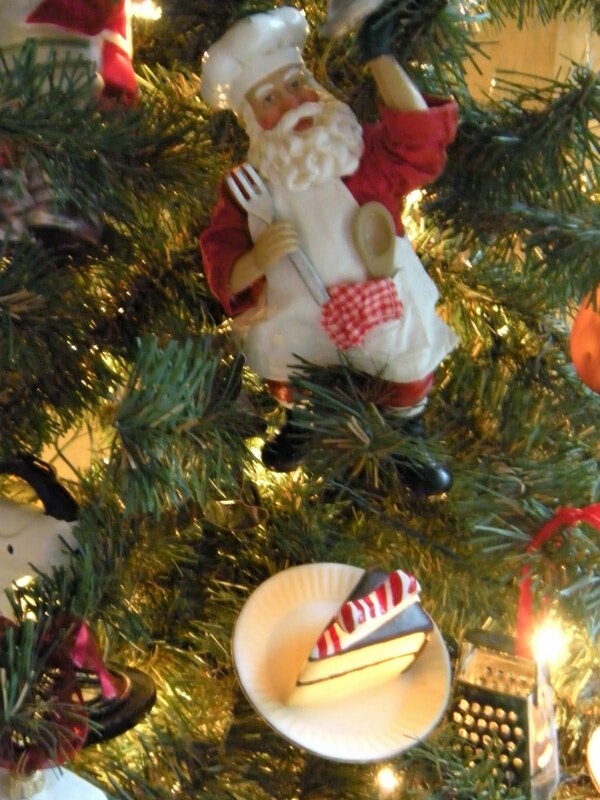 The most beautiful is a glass Waterford chef Santa. Because I work retail in a business driven by food holidays (think Thanksgiving here), I have a pass to get Christmas up early. Lots of baking ahead.....Happy Thanksgiving. "These are dark times indeed...but you can't fight this war alone Mr. Potter". Tonight at 12:01a.m. Harry Potter and the Deathly Hallows opens. The end is near. What a wonderful ride it has been. I remember when the books first released and they were banned....amazing really. I love the battle of good vs. evil. Steven King has successfully done it for years, and I am a "constant reader". 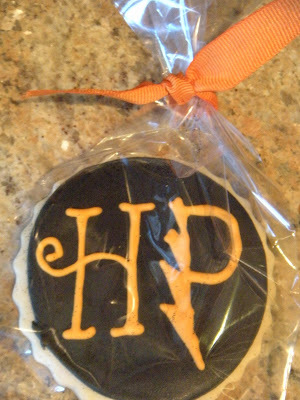 So in honor of the movie opening, I made Harry Potter cookies for a UT Knoxville student's birthday. And of course it has started a bit of a chain reaction, Harry does that to people. So here's the cookie. Classic Harry. I will see the movie next week with my son. We went to the midnight book release for this one, so it is only fitting. I loved racing through the books with him, and plan on rereading every last one before I see the Part 2 of the Deathly Hallows. I decided to go back to this blog and do it again, so I though I would repost. It is one of those things you have to just try! There's nothing new about using kitchen ingredients for beauty. I have rinsed my hair in vinegar many times,tried the egg white facial mask, olive oil hand conditioner, mayonnaise as a hair conditioner, even brushed my teeth with strawberries once. You have to throw away the toothbrush because of all those little seeds, I don't even remember why I did it, I think it was before you buy whitening in every dental product. Anyway, recently I came across a news bit in a magazine praising the benefits of the Miracle Whip facial. So naturally, I googled it and found some really interesting posts. The best is here. The original post was put up March 2006, and has garnered almost 60 comments from people like me who are like "What the heck, let's slather salad dressing on our face and see what happens". So here's the deal, indeed slather Miracle Whip all over your face, avoiding the eye area. Some readers also put it on their lips, most mayo eaters will opt out of that. Relax for 20 minutes, do not breathe deeply, because it stinks like Grandma's macaroni salad. After 20 minutes, wipe gently with a dry washcloth and then rinse and wipe your face clean with warm water. People were amazed at the dead skin coming off their face. I didn't have layers of skin come off, but after drying my face, there was a little "zingy" feeling, probably from the vinegar, but my skin was as smooth and soft as a babies. Amazingly smooth. Really. So I did it again every night for a week. I couldn't wait to see what happened. I'd either look like a 21 year old, or my face would be covered in pimples. I'm also thinking of putting it on my extremely dry feet, I'll let you know how miraculous that is. So, I kept up the facial for a solid week. I never really got accustomed to the stink, but every night my face was so smooth, crazy smooth. Toward the end of the week however, my skin was a little sensitive which is one adjective I never use to describe my hide. I think the best way to do this is maybe every other night, and then just maintenance. Sounds rather invigorating now, since I haven't done it in awhile, I just may raid the fridge tonight. I Am Not a Top Chef ,Yet! Top Chef is my favorite show. Period. I love Colicchio, Padma, the guest judges, especially Bordain. Yes, I said it, I am a closet Bordain groupee. I do watch reality shows, and that includes Big Brother, Survivor, Hell's Kitchen, Biggest Loser and American Idol. I know that it is all a figment of an editor's imagination, but I find real people far more interesting than actors. But, I do need to clarify: I do not watch Jersey Shore, Hoarders, Maury or Jerry, you get the idea. Top Chef is exciting because these contestants are in their element. They win by being creative and thinking on the fly, not by following a recipe in their back pocket. They respect the other contestants, (at least in a good season), and they recognize that this is a great platform for furthering their career. I don't eat out often, at least not that type of food, but I love to watch every detail in the dishes. I have no aspirations of cooking at that level, I am not a chef, and that's okay, I am a happy foodie. But then came Top Chef Just Desserts. All of a sudden, I want to be on a reality show! The contestants are colorful pastry chef types. I loved Zach and his Disco Dust until he got all cliquey with the Go Diva group. Yigit is amazing and cute, but tries to do too much, and that is a sign of a guy full of ideas, not a bad thing unless you are being timed. Not a Heather fan. I think Morgan is cocky but hey, he can back it up, and I am pulling for him to win the whole thing now that my FAVORITE is gone. Eric. The lowly baker. He saw almost immediately that most of these contestants were trained professional pastry chefs, (which is why I contentedly watch from the couch). 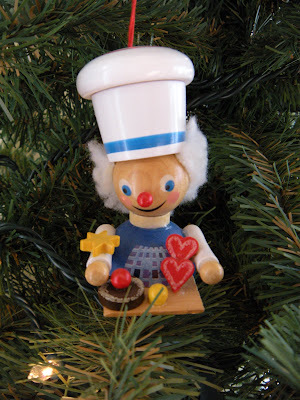 He mused that he was "just" a baker, and that made him my favorite. Dessert doesn't always have to be over the top, it just has to taste good. There were challenges where he had to step up the presentation and the creativity of the dessert and he went with the flow. He got booted over some shortbread. A sad way to go, but as he exited, he said, "I am a Chef!" Yes you are, and you have a loyal following right here who loved your comfort desserts and your humble attitude, those will take you to great lengths. So dessert. One challenge was a bake sale at a high school. I loved this challenge, right up my alley, as my most loyal customers are in their teens. Eric won having made Nutella Rice Crispies and chocolate chip cookies. Two of my favorite things. I make Rice Crispy Treats about twice a year(no more) because I can't keep my hands off them. I figure since it is mostly cereal they are perfectly acceptable for breakfast. And since the rest is marshmallows, well, they fit right in to lunch, dinner, dessert and bedtime snack. Nutella, yea, I love this stuff on a spoon. Other than a crepe, I haven't found a great recipe for it. I was hoping these winning Nutella Rice Crispy Treats would be my best of both worlds winner. So I found the recipe here called Peanut Butter Krispy Bars and decided to whip up a batch. After reading the recipe the reality that "I am not even a baker" set in. Who makes Rice Crispy's without Jet Puffed Marshmallows??? Eric does. Dang it, I just didn't have the time to make the bars with corn syrup and a thermometer. So that was my first change in his winning recipe and the beginning of a long list of problems to come. The next was to shrink it a little. It is all in grams, which is okay because I use a scale, but his recipe would be enough for, well, a bake sale. I needed them for a little meeting. So I started dividing up the quantities and shrunk the pan, and mixed and melted and pressed in the Rice Crispies. I wasn't happy. I had them in a sheet pan which has very low rims, and the bars were to the top. I had a little extra in a small glass pan. I hate thin Rice Crispy Treats, I generally make them in a 9X9 so they are like 3"tall. I decided to slug on, even though I knew that this is where I generally am finished. A perfect unadorned Rice Crispy Treat. But these were too thin for me to get excited over. The first chocolaty layer for the bars in his recipe is milk chocolate, Nutella and butter, (YIKES!). Well as soon as I began to melt it all in a saucepan the whole pot seized up. Rookie mistake. Damn. I added enough milk (no cream on hand) to return it to spreading consistency and spread it over the skinny little bars. It wasn't pretty. Then I filled the sink up with soapy water and gave up. Never went to the next topping of semi sweet chocolate and peanut butter. I was defeated without a time restraint or competition from professionals. I butchered the winning recipe and I'm afraid Eric would be disappointed. I'll be back at this recipe. I am going to get it to work and report back. But fear not, the mistake tastes delicious for breakfast (that Nutella makes it even more breakfast-like) or whatever meal you decide to add it to. Maybe I'll try Eric's winning chocolate chip cookies next time! Happy baking. If you get these done, I want a peek at them please! Not even cute Memphis pennants could help the Tigers with U of Tennessee. A few little penguins... My favorite branch of the military. 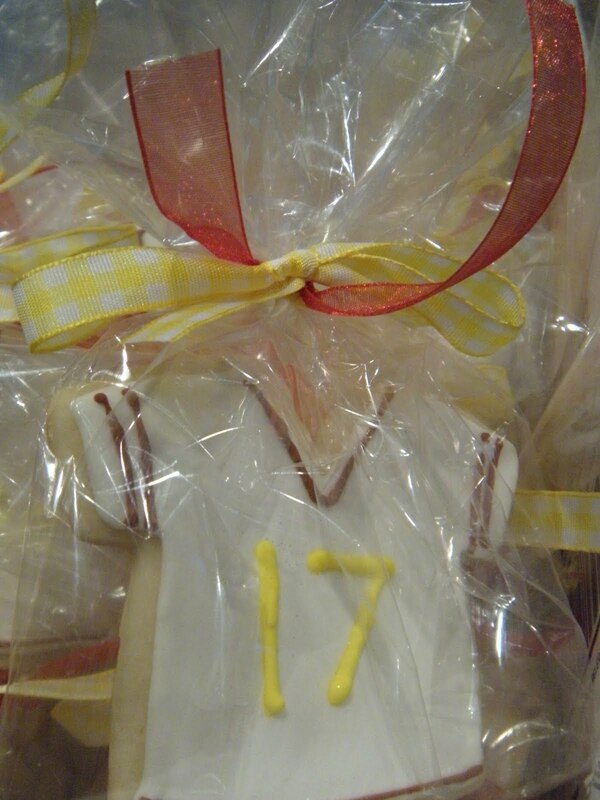 A little sweet for the St. George soccer team. An assortment of Halloween, St. Agnes volleyball and a few other treats. More soccer team treats. And for my favorite cadet in Squadron XXV Rock Hard and Red Eye! Here is a favorite repeat. I am heading back to work in a low level management position, but it will cut into my blogging! This is a lot like the molasses cookie at that famous coffee chain, Big, soft and chewy, they beg for hot coffee or cider. Perfect fall fare for the first of November. 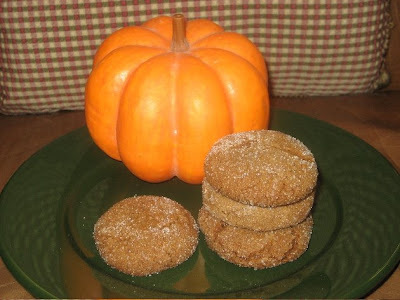 So, happy fall, get in there and bake!